If a picture is worth a thousand words, and I have two images to talk about today, this article should top out somewhere around two-thousand words, right? Don’t worry, I won’t make you listen to that much of my gibberish. 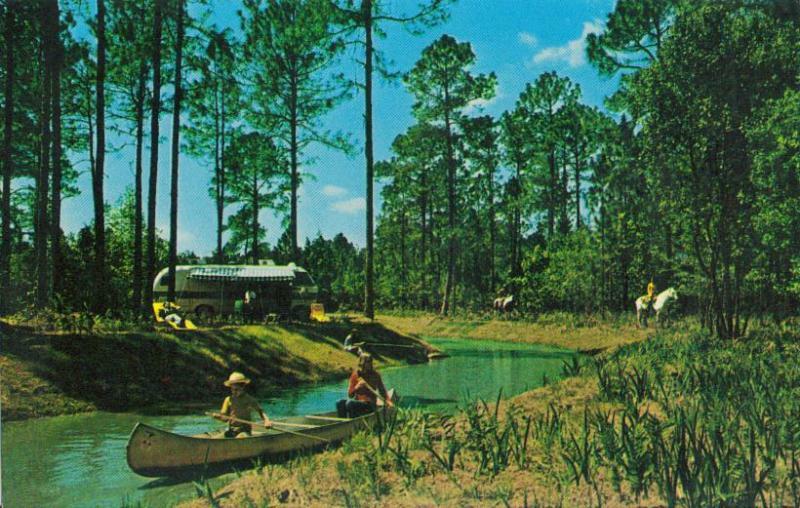 We are, however, going to compare a pair of images from early on in Fort Wilderness’ campaign to attract campers. This first image is one that many will recognize as one of the first postcards produced for the roughing it retreat. In fact, the logo on the back of the postcard was even printed in blue ink and included the Florida flag which demarked early Walt Disney World postcards and, in the flag‘s case, began being removed sometime around 1975. The text includes all the outdoor recreational highlights featured in the front vista and then some. So, what do we have here? 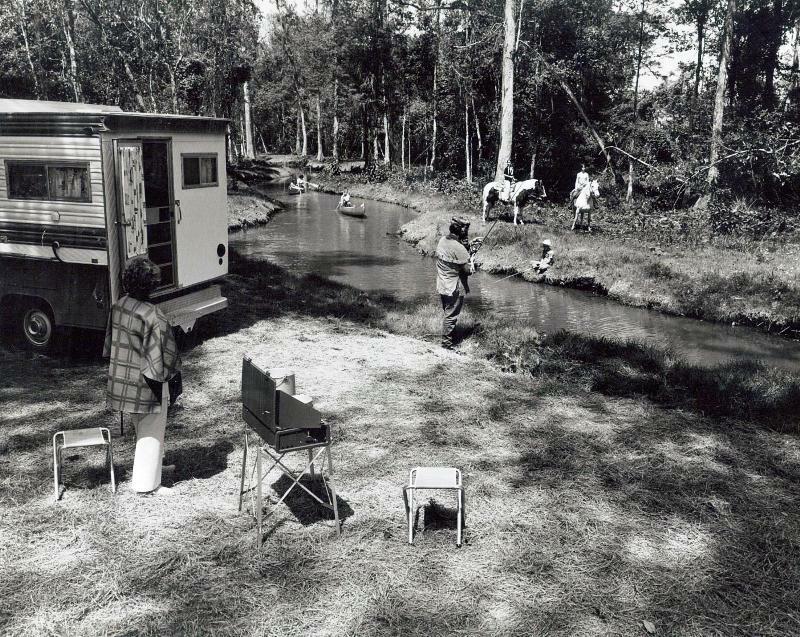 A trailer set up with folding chairs to lounge upon, a canoe excursion, fishing along the bank and horseback riding, all set against the backdrop of live oaks, slash pines and palmettos. This selection of recreation is precisely the message Walt Disney World wanted to send about Fort Wilderness. How can I be so sure? By jumping ahead a few years to a 1979 press photo. Notice any similarities? Trailer, check. Folding chairs, check. Active canoeing, check. River fishing, check. Horseback riding, check. 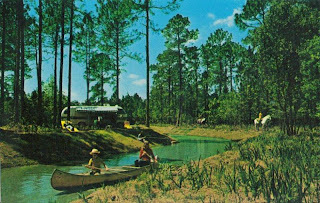 Almost a decade after it had opened to the public, Fort Wilderness was still sending out the same recreational message to potential guests that it had been in its early years. If its not broke, don’t fix it, right? These days, a majority of the underbrush that gave Fort Wilderness the sensation of roughing it has disappeared, but the recreational have remained and even expanded. While there has been plenty lost in and around Fort Wilderness (I’m looking at you River Country and Discovery Island), the rustic Florida backdrop and outdoor activities continue to attract new guests and spark memories in guests returning to the stomping ground. Oh, and did I mention the fried chicken?